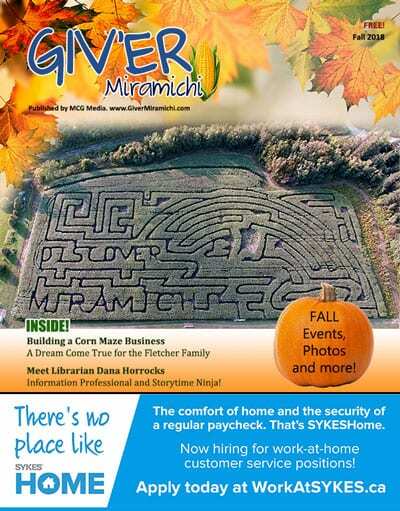 The Fall 2018 Issue of Giv’er Miramichi Magazine is Here! • Fall Events from around the region – and some Christmas events too! • St. John Ambulance Therapy Dog Orientation & Evaluation coming up in November. • Dickison’s Pharmasave – A look back at the history of this locally owned and operated pharmacy. (note: in the printed version of Giv’er the dates for the Christmas Kettle Campaign should read Nov 19th to Dec. 24th). • Here We Grow, City Hall Updates, Photo Submissions, and more! Visit www.giverontheriver.com where you’ll always find good news, and positive, uplifting stories! You’ll also find current and past issues of Giv’er Miramichi magazine, the Mighty Miramichi River Guide, a list of locations to find our publications, and a place to submit your stories and photos. One Response to The Fall 2018 Issue of Giv’er Miramichi Magazine is Here! In the past I have greatly enjoyed the Atlantic salmon fishing reports posted by the various lodges and businesses on a weekly basis throughout the fishing season. What has happened to them?